For schools named "McDonogh High School", see McDonogh High School. 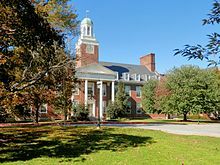 McDonogh School is a private, coeducational, PK-12, college-preparatory school founded in Owings Mills, Maryland, United States in 1873. The school is named after John McDonogh, whose estate originally funded the school. The school now enrolls approximately 1,300 students, between 90 and 100 of whom participate in the Upper School's five-day boarding program. McDonogh employs approximately 177 full-time faculty members, more than 80% of whom hold advanced degrees and 20% of whom live on-campus. McDonogh is regarded as one of the Baltimore region's most prestigious preparatory schools and has been called a "Power School" by Baltimore magazine. The school's students frequently matriculate to Ivy League and other top-ranked colleges and universities. McDonogh's athletic programs have also seen widespread success, particularly in lacrosse, soccer, wrestling, and football, where the school's teams have been nationally ranked in recent years. The school is a member of the Association of Independent Maryland Schools. The school was established outside of Baltimore, Maryland in 1873 and funded by the estate of John McDonogh, a former Baltimore resident, who died in 1850. Documents in the archives of McDonogh School include letters from his former slaves thanking John McDonogh (prior to 1850) for his giving slaves the opportunity to work to buy their freedom and transport to Africa. McDonogh was established as an all-white, semi-military school for orphan boys, who worked on the farm in exchange for their tuition, room, and board. Paying students arrived in 1922, and day students in 1927. The first African-American student was admitted in 1959. In 1971, the military traditions of the school were discontinued. The school became coeducational in 1975. Full and partial McDonogh scholarships continue to this day, with $5.4 million in need-based aid awarded in the 2017-2018 school year. David J. Farace, the present headmaster, is the 13th head of school. He assumed the position in 2018, succeeding Charles W. Britton. The Upper School offers a college preparatory curriculum that includes courses in English, foreign language, history, mathematics, science, visual and performing arts, and physical education. Honors or Advanced Placement courses are available in all academic departments. Upper School students must also complete a community service requirement. All students perform an academic project independently or in small groups during the final three weeks of their senior year. I will not lie, cheat, or steal. I will respect the rights and well-being of myself and others. The academic calendar at McDonogh follows a trimester system. ^ a b "McDonogh School Fact Sheet 2013-2014". McDonogh School. Retrieved 2013-10-10. ^ "Senior Administration". McDonogh School. Retrieved 2013-10-10. ^ "Power Schools". Baltimore Magazine. Retrieved 2013-09-29. ^ a b "Admission Quick Facts". McDonogh School. ^ "The McDonogh Ode,". The Gambit New Orleans. Retrieved 2010-02-23. ^ "A Brief History". McDonogh School. ^ "McDonogh Announces the Appointment of Charles Britton as 12th Head of School". McDonogh School. Retrieved 2008-10-14. ^ a b "Upper School Curriculum". McDonogh School. ^ Rousuck, J. Wynn (29 September 1999). "Adkins discovers his home onstage". The Baltimore Sun. Retrieved 26 September 2015.